The most efficient wood chip drying system, designed and manufactured in the UK. 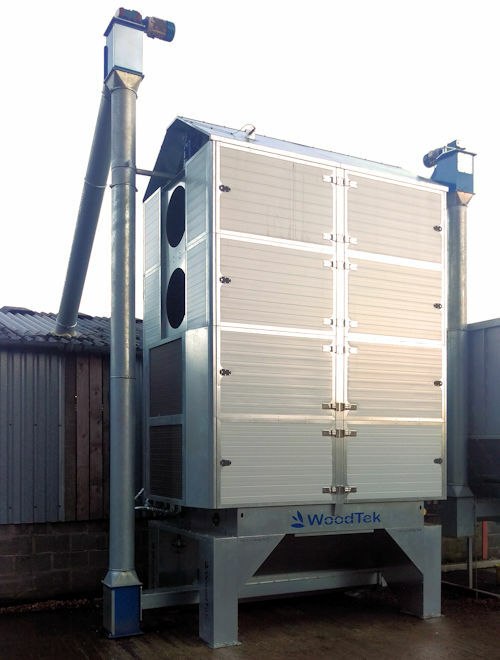 Drawing on over 30 years of experience in kiln drying timber, Woodtek have designed and developed one of the most efficient and economic dryers on the market. The Eco Compact Wood Chip Dryer is their second generation dryer. The concept was to design and develop a dryer with a compact footprint, which maintained the output of their original 40' containerized dryer. The results surpassed their expectations, as not only have they been able to maintain the same output with a footprint 75% smaller, they have also increased the electrical efficiency by an incredible 74%. To understand how the wood chip drying process works within the dryer, we will explain the working principle of the dryer. 1. Fresh Woodchip is fed into the top of the dryer via the vertical loading auger. 4.Finally a central cross auger at the bottom of the dryer feeds the dry woodchip into the vertical unloading auger. 1. Air is drawn into the bottom two modules of the dryer. As the air enters the dryer it is heated by two large heat exchangers. 2. The two centrifugal fans draw the hot air through two large ducts that run through the centre of the dryer and blow the air to the left and right hand sides. 3. The air then forced through the two louvred columns filled with wood chip into the centre section of the dryer absorbing moisture in the process. 4. In the centre section section of the dryer the air is forced upward into the top two modules where it passes back through the two louvred columns to the outside of the dryer, which at this point are full of moist wood chip. This second pass is key to the efficiency of the dryer as not only does it take out more moisture the cold damp wood chip recovers the heat from the air before it exits the dryer. 5. Finally the air is forced to the front and rear of the dryer where it exits through the exhaust vents. The Dryer is constructed from Alu-zinc coated steel for excellent corrosion resistance. All parts of the main chassis are laser cut, folded and fixed together with a speed fastening system. This makes construction of the dryer very fast and economical. All gearboxes are supplied by STM uk. Working closely with them during the development of the dryer has ensured that all gearboxes have the correct torque factor to give maximum long term reliability. Using their highly efficient Bevel Helical gearbox which boasts an impressive 95% efficiency is an important of reducing electric consumption therefore improving the overall drying efficiency.